Fight fans, British ones in particular, will possibly have a tough choice to make on the evening of April 21st: attend/watch at home the hugely intriguing Carl Frampton-Nonito Donaire fight in Belfast, or attend/watch at home the Amir Khan comeback fight in Liverpool. Both British stars will engage in their respective fights, while a ratings battle will also take place, between Sky Sports, who will televise Khan’s comeback, and BT Sport/BoxNation, who will do the business with the Frampton-Donaire clash. Frank Warren, who promotes Frampton, obviously wants his show to triumph, but Eddie Hearn, who of course has just signed Khan to a three-fight deal, believes the star power of Khan will see to it that his show gets the bigger viewing figures. As for a fan perspective, it’s difficult to say right now which show will prove the most enticing, simply because we do not yet know (not until next week some time) who Khan’s return foe will be. Apparently there are around a dozen or so names on the list; with recognisable names, Chris van Heerden, Josesito Lopez, Breidis Prescott, Adrian Granados, Antonio DeMarco and some others in the frame. Who is the bigger attraction, Khan or Frampton? 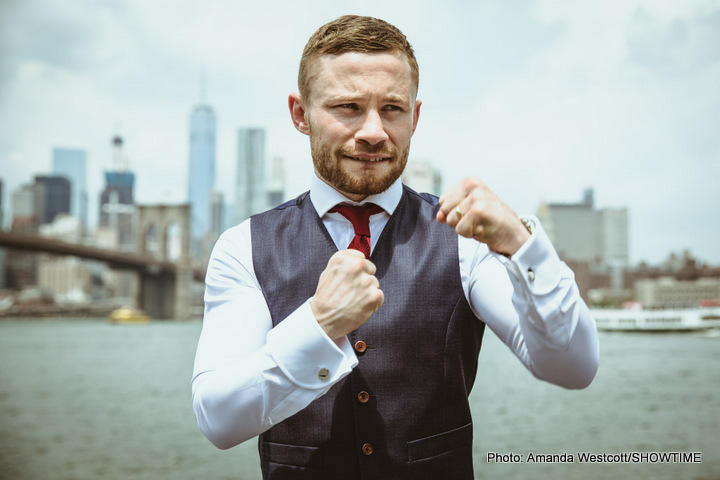 Both are big names, both are proven warriors who bring excitement and both have an army of fans (the more recently active Frampton especially). But if Khan faces a Granados or a Van Heerden, will that be as good a match-up as Frampton-Donaire? No way. It will be a test of the star quality Hearn feels Khan has retained if he is to attract more TV fans than Frampton in his first fight in almost two years. Have fans forgotten about the former 140 pound champ? If, for sake of argument, Khan does fight Van Heerden on April 21, which show will YOU tune into: that or the showdown in Ireland? Of course, in an ideal boxing world, no choice should have to be made, as both cards would – and should – take place on separate dates. But here we are with two of the biggest names in British boxing fighting on the same night, in different venues, on different TV channels, at about the same time of day. Perhaps the quality of the respective under-cards will sway fans when it comes to making their choice?